Hi, my name is Cassie Sheffield and I am 20 years old. Four years ago at the age of 16 I had my first episode with blood clots. It was Easter weekend and I had told my mom that I had been getting choked in my sleep, and when I would get up in the mornings I could taste blood. Well, we decided if it wasn't better by Monday then I would go to the doctor. Although we didn't know it at the time, waiting until Monday was the wrong choice. At about 3:00 A.M. on Sunday morning, I awoke from my sleep and could hardly breathe; and I couldn't call for anyone to come and help me. I made it into my parents' room, and they immediately got up and rushed me to the emergency room. The doctors began running tests. An x-ray was done of my lungs and the doctors couldn't figure out what it was; it looked very similar to the flu being in someone's lungs. My mom asked the doctor if it could be a blood clot. Blood work was done and confirmed that my levels were very elevated. I was then rushed to a larger hospital about and hour and a half away where I immediately was rushed into surgery to have a Greenfield filter put in place so no more clots could go thru my heart. I was in the hospital for about a week and a half when I was released. Before my release, my legs were checked for clots and showed no signs of ever having a DVT. My left leg began hurting, and the doctor said it was from not being up in a while and said that it should not be checked again. He made a very rude comment to my mother when she asked should my legs be re-checked and he actually said to me "I think your mom just doesn't want you to go home." I did go home that day. That night I was lying on my parents couch, because I couldn't get comfortable in my bed. What I experienced was very out of the ordinary. I was standing at the end of the couch looking at my body laying there, I could see my mom in the bed, and even the dog in the chair next to me and the silhouette of a large man standing in the doorway. I awoke to what felt like water being splashed on my face, but it was my mom standing over me trying to wake me up. She said something told her to check on me and there I was laying lifeless on the couch with my eyes wide open. The next day I was re-admitted to the same hospital and remained there for almost three weeks. I underwent another surgery that was done to try and bust up the clots that were then found all throughout my left leg. Needless to say I never say that doctor again (he was an associate of my main doctor). My parents saw him in the hallway, and he held his head down and never said a word. After I returned home, I was advised to never go back on birth control, and I was on Coumadin for about 6 months. In January of 2007, I became pregnant with my first child. During the first trimester of my pregnancy my mom (who has also had some blood clots) and I were both tested for clotting disorders. Our fears were confirmed, we have hereditary anti-thrombin III deficiency. I was then placed on Lovenox shots twice a day throughout my entire pregnancy. I was seeing my primary ob-gyn and then a high-risk doctor as well. Everything was going well, until September 13, 2007. I had stayed at my parents' house the night of the 12th because my fiance was working the night shift and no one wanted me at home alone. The morning of the 13th, I woke up about 6:00 A.M. and realized my baby had not awoken me during the night by kicking me all night. That was strange because he had some powerful kicks, and I rarely got much sleep at all. I went home, drank a coke, and ate something sweet. About 45 minutes later, I still felt no movement. As soon as the doctor's office opened, I called and was told to immediately come for an ultrasound. I went in and 2 ultrasounds were performed. They both checked out 10 of 10. Everything was said to be fine, but I knew something wasn't right. I was then told to come back that afternoon for my scheduled appointment. My fiance and I went to get a bite to eat and then met my aunt at the doctor's office for my appointment. I was placed on a fetal stress monitor. We were in the room when the nurse came in to check up on us. She looked at the monitor and immediately ran to get the doctor. He looked at it and then told me to go to the next room to see if I was dilating at all; I wasn't. He then told us that something had caused the baby to get stressed, and we had 30 minutes to get to the baby. I was hysterical and was so scared of loosing my baby. My doctor took me in to have an emergency c-section. When he reached my baby, he wasn't breathing. I was awake during the whole c-section. Finally, I heard my baby cry, but then I realized that every doctor from our hospital and most of the nurses were in the room. Little did I know that the cry I heard was going to be my baby's first and only cry. I didn't get to see my baby boy, Noah Caiden Brown, until he was brought to my room before being transferred to the Neonatal Intensive Care Unit at another hospital about 2 hours away. The next few days were very difficult, I didn't get to see or hold my baby. My mom and my fiance went to see my son the day after his delivery. All I could see were pictures. I had him on a Thursday, the following Sunday I was allowed to leave the hospital to go and see my baby for the first time since he had been born, but I had to return to the hospital that evening. I wasn't prepared to see my baby the way he was. He had tubes and IV's everywhere, but all I truly saw was my BEAUTIFUL baby boy. He was so beautiful. 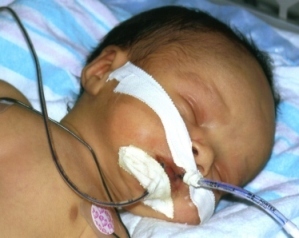 A doctor then came in and told us that our baby wasn't likely to make it through the night because of the brain damage he had suffered from the loss of oxygen. I held and loved my baby until I was told that I had to go. That ride home was horrible; we were planning a funeral for a baby that wasn't even dead yet. Well, my baby did make it through the night. I was released that Monday and went straight to my baby. We were able to get a room at the Ronald McDonald House next to the hospital where Noah was. I spent as much time as I could with him. I read to him, prayed with him, held him, and, most of all, loved him. One week after giving birth to Noah, I realized that my left leg was hurting behind the calf and had a red spot. I immediately knew what it was - a blood clot - but I didn't want to tell anyone because I knew that I would be re-admitted and wouldn't be able to see my baby. I told my fiance and then my mom. I went to the hospital the next day, and sure enough, my fears were confirmed. 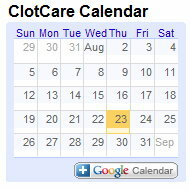 I had multiple clots in the same leg that still had "old" clots in it. I was then rushed by ambulance to another hospital next to my son. The doctors thought I would loose my leg. Thankfully, I did not. My heart was hurting so bad because I couldn't see my baby. My fiance and my family went back and forth between hospitals seeing me and seeing our baby. I was released that Monday and was finally able to see my baby again. His head had been swelling and he was going to need surgery to get the fluid off of his brain. He was doing well other than that. He was breathing on his own. The only tube he had was a feeding tube. That Thursday, when Noah had turned two weeks old, I had a check up back at home. So my mom, my fiance, and I went home. After my appointment, we immediately left to go back to Noah. I had spoken to his nurse about 45 minutes before we got there and everything was fine. He had actually pulled his feeding tube out, which kind of humored me. When I went in to see him there was a nurse there doing some test and I thought it was for his surgery. It wasn't. Noah's nurse had noticed his right leg was turning blue. His blood wasn't circulating. The doctor then asked that I go to the Ronald McDonald House and have my hematologist fax over all my papers of blood tests that had been performed on me. While waiting on the fax my phone rang. It was the call that I had been dreading for two very long weeks. My baby was dying. I lost it. My family calmed me down and told me I needed to go to the hospital. 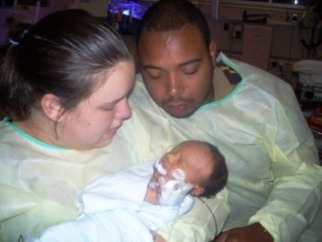 When my fiance, my mom, and I got to Noah he was dying. Even now as I write this email the tears are too strong to hold back. I was facing Noah and my fiance and my mom were facing me. I saw his heart rate go from 48 to 0, an image that will forever be in my head. My baby was gone. He had a blood clot. He fought so hard, but his little heart just couldn't take it. The day before Noah died, my daddy left to go back home to take care of business. He, like all of us, thought Noah was making progress. My daddy being the big man he is, never held Noah, because he was scared of getting attached. But, it was too late, we all were more than attached; we were in love. After Noah died, I called my daddy, because I knew I had to be the one to tell him. He had a friend drive him down to the hospital, which was about 2 hours away. 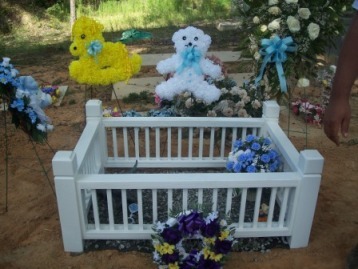 That night my daddy made the choice to bring Noah to the funeral home where we live. He held Noah all the way home. I know it was probably the hardest thing he has ever done in his life. I miss my baby every day. Some days are good days; not "good" in the normal sense, just good in the fact that I don't cry that day. Then, there are the bad days, the days where the things that seem so small to others are the things that make me cry. When a mother looses a child who is older, say 20 or so, then she sees the wife he will never marry, the kids he will never have, etc; But, when a mother looses her baby, she sees everything, the first word she never hears, the first step he never takes, the first day of school that will never come, the firsts that she will never see are endless. I can be at a high-school football game and have to fight off tears, because I know that my baby will never be on that field. But, I do know, that God chose my baby. He spared him from the pain and sins of this world. As much as I want Noah here, I know that he is in a much better place and one day I will see him again. Since Noah's death, I have been to many doctors, and I am going to another this Wednesday. Some say never get pregnant again; others are optimistic. All I want in life is to be a mother and a wife. My dream of being a wife will come true next June when my fiance and I wed. But, my dream of being a mother is still unknown. I am a mother now, just a different kind; I am a mother to an angel. An angel that will always hold a place in my heart, a place that no one else can ever touch. Noah was my first child and his place will never be taken. When I do have other children they will know that they had a brother before them, a special brother, and they will know they have an angel brother. Some people believe there are angels on earth and some don't, but me, I know, because I held one.